Vanuatu Aquatics have been very busy with exciting new projects in the works. We have had the opportunity to take part in 2 FINA development clinics where we have had a professional in water polo and Swimming come to Port Vila to work with our coaches. Our water polo and swimming programs coaches have benefited greatly from these opportunities and we look forward to taking part in plenty more clinics. In July we had Mr. Noel Harrods come across to Vanuatu to run a referee development clinic for water polo. Mr. Harrods has been a part of Australian Water polo for over 20 years, starting as a player and then transferring to become a referee. He has refereed at over 50 international competitions along with 1 Olympic Games. We were very excited to learn from someone with large amounts of experience. We had a big number of interested participants including our swim coaches, athletes and school teachers who help deliver our swimming programs. In total we had 14 participants. Water polo is still a very new sport here in Vanuatu however the interest is rapidly growing and Mr. Harrods can see great potential in the future. The course was run over 5 days including theory and practical sessions using the beautiful Port Vila seafront as a our pool. 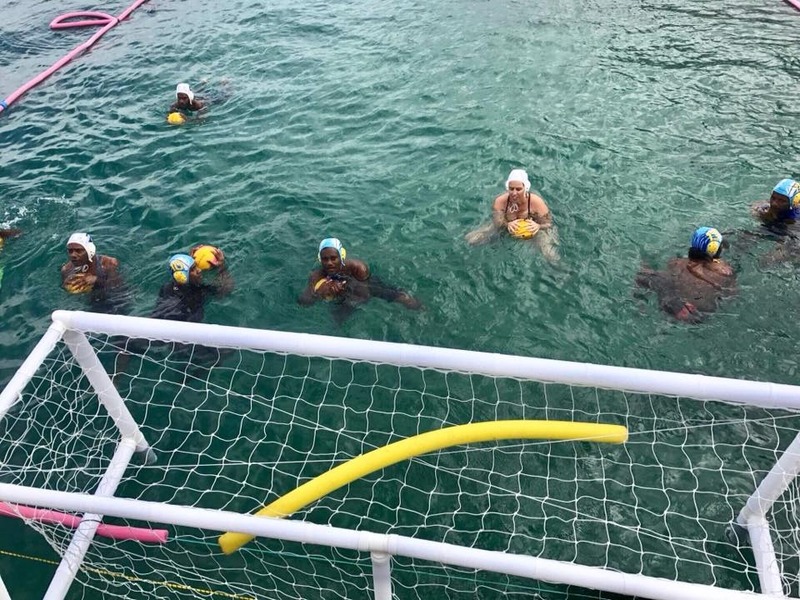 At the conclusion of the course Vanuatu Aquatics hosted a Water Polo 5’s competition to allow them to demonstrate their learning from the course. On the day of our Water Polo 5’s competition we had 6 teams register, setting up a full day of water polo and plenty of opportunities to demonstrate the skill of water polo in Vanuatu. All participants of the FINA Referee course officiate a game with Mr. Harrods looking n and assisting when needed. Mr. Harrods said “having the competition at the end of the course was a fantastic way to put in to practice what we have learnt this week’. He was very impressed with the competition and is looking forward to working with Vanuatu Aquatics in developing the game in the future. The start of September we were very fortunate to host another Coach of Olympic level. Mr. Dave Kelshiemer has an extensive resume having coached in the Caymen Islands for 5 years where he developed 2 swimmers who went on to represent the United States of America at the Rio Olympics. We had our development officer, community coaches along with some teachers attend the course. Mr. Kelshiemer ran our coaches through planning sessions, timings and on-land training to assist in developing and achieving better results from swimmers. Our coaches were grateful for the opportunity to learn from a coach who is passionate about learn to swim all the way up to elite athletes. The Friday afternoon session and Saturday morning session was dedicated to our coaches demonstrating some of their learnings from the clinic. We invited our top swimmers in Vanuatu to come to the sessions and have the chance to learn and be coached by an Olympic coach. Our swimmers were beyond excited and enthusiastic about training with Mr. Kelshiemer. Vanuatu Aquatics are very grateful for these opportunities from FINA. Our programs will be able to develop and grow with their ongoing support. To the future of swimming in Vanuatu, we have our National Team selection coming up in October. The team selected will compete in the FINA Short Course World Champs in December.